Between 1912 and 1915 several small buildings were added to the Garden. 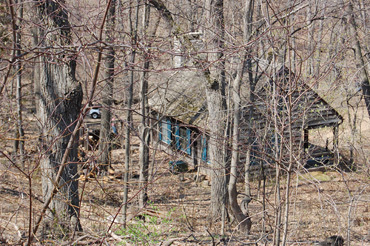 First a tool shed was moved into the Woodland Garden. 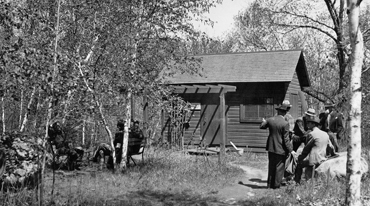 Then in 1915 a larger wood "cabin" with two rooms was built to Eloise's specifications and she noted its completion in her log on April 9 of that year. It was sited on a flat area in the Woodland Garden. Eloise Butler named this area the "plateau," a natural terrace, about one-half acre in size, half way down to the wetland from the South entrance (a). It was for many years unheated but in 1944 Clinton Odell donated a small wood stove and stove pipe but on cold days Martha Crone would report that water froze in the watering buckets, stove or no stove. Prior to the wood stove, Martha would bring a portable kerosene stove from her home to provide heat and the Park Board furnished the kerosene. 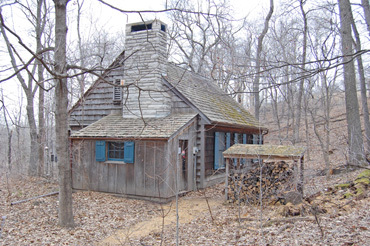 The building was divided into two sections, one part serving as a tool room and the other served as office, visitor center, shelter and all other purposes until 1970 when the new shelter shown below was completed and dedicated to Martha Crone. 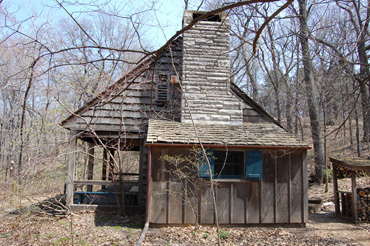 It was known as "the little cabin" and as the "garden office" and originally sported a sign that read "Office of Curator - Wild Botanic Garden;" shortly thereafter the name was changed to “Native Plant Reserve” but the sign was not changed until later when "Wild Botanic" was changed to "Wild Flower" in 1929 (b). 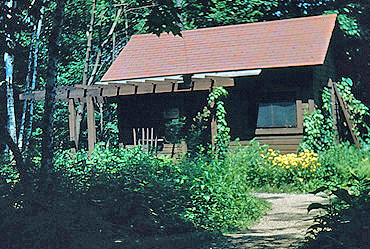 When the Martha Crone Shelter was complete, the old "office" was moved to near the back gate where, [per Ken Avery's notes, April 1973, The Fringed Gentian™], it remained for a number of years. Over time several trellis were added to the outside, the most expansive, finished on June 8, 1922 incorporated a pergola. Eloise Butler had many plant species placed around and on the pergola and trellis. She frequently referenced this planting in her Garden Log and in a 1926 essay, she described the collection in some detail. 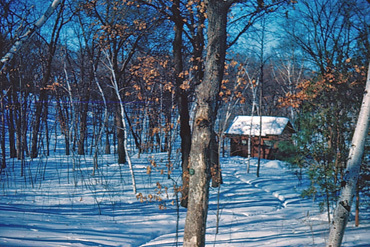 Old Garden Office - Winter view, SE side, Feb. 16, 1950. 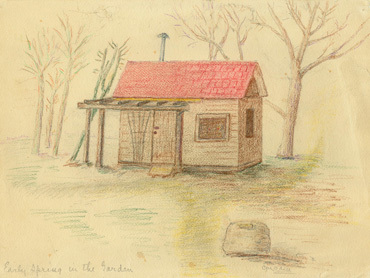 Clinton Odell created this sketch of the old office and titled it "Early Spring in the Garden. Undated but circa late 1940s - early 1950s. 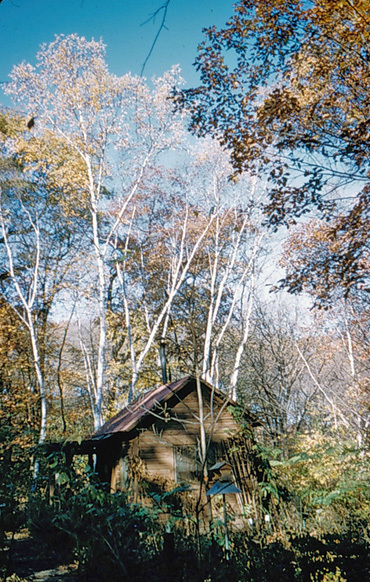 Image courtesy of the Minnesota Historical Society, Martha Crone Collection. Historical Photos: All historical color photos are from Kodachromes taken in the Garden by Martha Crone on dates noted. Click on any of the 4 smaller photos for a larger view. Photo below is taken from the east side of the old Office showing fall foliage, Oct. 21, 1955. This is the last photo we have of the old office before it was replaced. 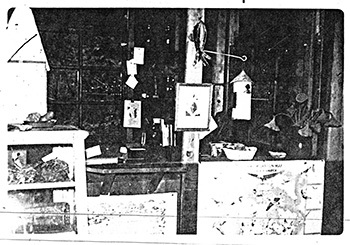 Below: Two old photos of the interior of the old Garden office. Photos - Friends of the Wild Flower Garden. Friends Project Committee Members were: Catherine Faragher, Friends' President; Martha Crone, Secretary-Treasurer, editor of The Fringed Gentian and former Curator; Kenneth Avery, Curator; Mr. Alvin Witt, building fund; Mr. Wilbur H. Tusler, building chair; Mr. Harry Thorn; Mr. Robert Dassett. 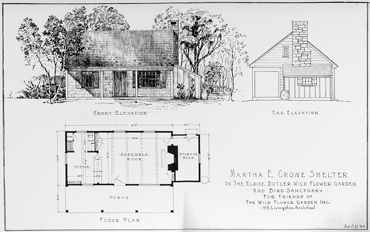 Above: General plan of the Martha Crone Visitor's Shelter as prepared by Hiram Livingston. Click on image for a larger picture. 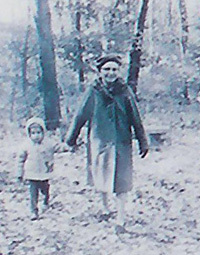 Martha Crone with her great-grandson, Alan Wander, age 3, on October 23, 1969, at the building site of the new shelter. Photo as published in the Minneapolis Star, Oct. 24, 1969, Minnesota Historical Society, Martha Crone Collection. The site excavation for the concrete slab was done by Park Board maintenance staff. The foundation footings were dug and laid by the Friends' contractor, Joe Peterson Construction. Running electricity and water to the Shelter (water also to rest rooms) by Park Board and NSP. The concrete slab was poured by Park Board maintenance staff. All structure construction was done by the Friends' contractor. Construction began in September 1969. By mid October the foundation and slab were completed so that building construction could begin. Funds needed for the project were not yet all in hand. There were pitfalls and miracles. Labor and lumber prices increased such that an additional $4,000 had to be raised. A large gift of $3,500 came in from Mr. H. J. Neils, former president of Flour City Ornamental Iron Co., and the Friends now had $23,260 for the shelter construction to be completed. Friends President Cay Faragher wrote to the membership: "Put a circle around Thursday October 23, 1969. That morning at 10 o'clock Martha Crone will be hammering in a golden nail from the old building and Barbara Flanagan will be there with her photographers." (9) On that date, Martha Crone hammered the “golden” nail and Barbara Flannegan was there from the Tribune with photographers. (4) See photo at right. The old structure was moved to a spot near the back gate. Joe Peterson Construction, 5215 Logan So. $22,700. 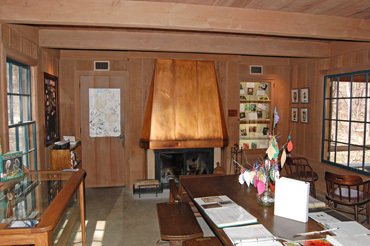 Originally, heat was to be provided by a Franklin Stove, but a memorial gift (see memorials section below) allowed a fireplace, stone chimney, and copper hood to be installed. Furnishings and a library were provided. The list of furnishings on 9-28-70, including the bird song recorder and the library was valued for insurance purposes at $2,286. 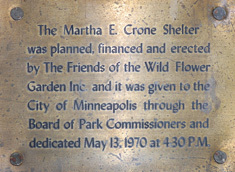 The monthly newsletter for the employees of the City of Minneapolis, "Around the Clock", featured the Garden in the June 1971 issue and commented on The Friends, their construction of the Shelter and then its dedication to the Park Board. 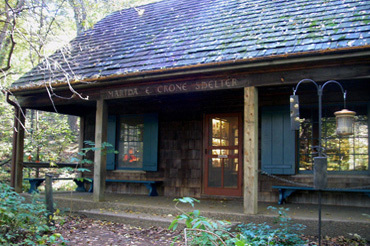 The Shelter was dedicated on May 13, 1970 and named the Martha E. Crone Shelter. (Dedication plaque shown at right.) Leonard C. Odell, son of Clinton Odell, was master of ceremonies. 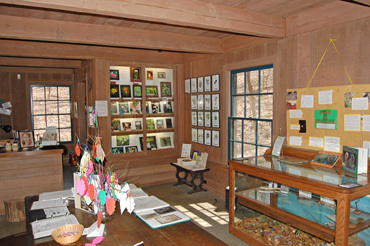 "I take this opportunity to express my appreciation and extend my heartfelt gratitude to all members and friends who made possible the beautiful shelter building in the Eloise Butler Wild Flower Garden and Bird Sanctuary and dedicated it to me. I am most grateful to those who have given of their time and effort to make it such a success. This is really the culmination of many years of my life devoted to the Garden." Additional details about the planning and development can be found in history years 1968, 1969 and 1970. 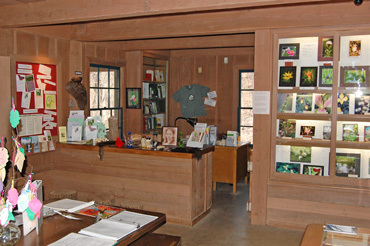 The herbarium that Martha Crone had put together over the years was never housed in the new shelter. Martha Hellander speculated that the collection may have gone to the University of Minnesota Herbarium. A south view from the walking path to the shelter. The SW elevation as seen from the walking path. The information area with patron handouts, volunteer desk and library. Click on image for a larger view. The main room with display cabinets and table. Click on image for a larger view. The fireplace wall with door on left to the storage room. Click on image for a larger view. 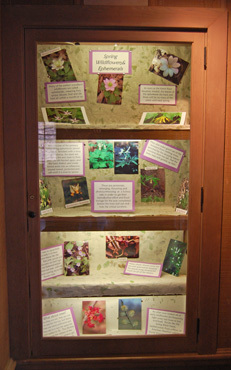 A display cabinet in the corner of the fireplace wall . The 81 x 42 inch walnut table (photo below) was a gift of Miss Elizabeth Schutt in memory of her mother, Mrs. Clara M. Schutt, who was a good friend of Eloise Butler and from whose property, Eloise Butler acquired plant specimens for the Garden. 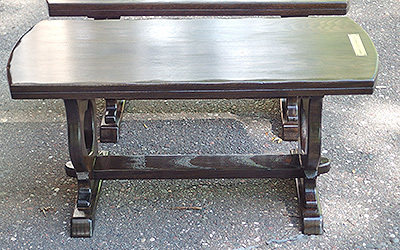 The six benches, 36 inches long, were the gift of various garden and bird clubs. The funds for the heat ventilator fireplace and chimney were a gift, in memory of Kathleen Dean Hillman, from her Girl Scout friends and from her parents, Mr. and Mrs. Alexander Dean. (The current heat ventilator was installed later). The exterior of the fireplace is cut limestone from Wisconsin, also funded by the Dean's gift. The music system installed in the Shelter was a memorial for Mrs. H. H. Livingston, the architect's deceased wife. The lintel over the front door is inscribed in memory of Margaret Tusler, wife of building committee chair Wilbur Tusler. She had passed away in the Spring of 1969, just before construction began. (Photo is of a metal sculptural insert in the main door). The history of Friends members being volunteers at the Shelter goes back to the time of building the Shelter, It was suggested by Mrs. Faragher that a committee from the membership of the Friends be formed to arrange for members to serve as "hosts" at the shelter and to care for the library, as such an arrangement would involve more members actively. (6). Volunteers, many of whom are members of the Friends, provide daily staffing at the Shelter to this day. Mrs. Carl (Mildred) Olson took charge of setting up the volunteer program for the first year and into 1971, then she turned it over to Dr. Marion Grimes so that she could become editor of The Fringed Gentian™ when Martha Crone retired from that position in 1971. Shelter "hosts" originally worked a 3 hour shift. The members of the first group to do this in 1970 were: Herman Arnott, Frank Carleton, Clark Chamerlain, Mr. and Mrs. Alexander Dean, Lester Ericsson, Dr, Marion Grimes, Russell Gutteridge, Preston Haglin, William Hardacker, E. A. Hedenstrom, T. A. Hoffmeyer, Hildegarde Holtz, Constance Humphry, Elsie Johnson, Franklin Kerr, Henry Norton, Carl H. Olson, George L. Peterson, S. C. Reed, Mary Simmons, T. E. Stark, Oscar Vanlander, Edward Verbarg, Miss Marion Griffith, Miss Elsie Johnson, Miss Elizabeth Schutt, Mr. and Mrs. Don Miller. "My great desire as president was to lay out a new and practical pathway leading from the main gate down to the shelter. The original path plunged straight down the hill. It was steep and narrow and a real hazard, full of potholes and roots. Another Project funded by the Friends was completed in the fall of 2007. The shelter has had various screen doors over the years but there was research evidence that the original design for a door was never followed through on and various substitute doors were installed. 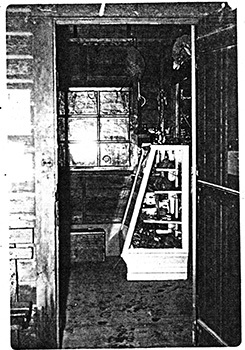 One door was damaged in a break-in at the Shelter in the Winter of 1977 and was either subsequently removed and replaced with the existing door or was repaired and replaced. So to get back to a more original design, Volunteer and Friends Member Kathleen Connelly and Garden Curator Susan Wilkins took on the replacement project and worked to find artisans to create it. The door is a work of art constructed of quarter-sawn white oak with mortise and tendon joinery. 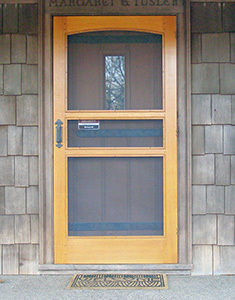 The carpenter, John May, constructed the door while blacksmith, Tom Latane created unique metal hinges and door handle (see images here). The design fits perfectly with the architecture of the Shelter building and looks as if it were always a part of the Garden. General Reference: Martha Crone papers and Friends of the Wild Flower Garden papers, Minnesota Historical Society Collections. (a) For details about the plateau, read this essay by Eloise Butler from 1916. (b) Eloise Butler wrote in 1916 - “It was soon found that the term “Wild Botanic Garden” was misleading to the popular fancy, so the name was changed to “Native Plant Reserve.” (1926 Essay) In 1929 the Park Board changed the name to the Eloise Butler Wild Flower Garden. Sometime in the mid-1970s the Park Board started using 'wildflower' instead of the original 'wild flower'.